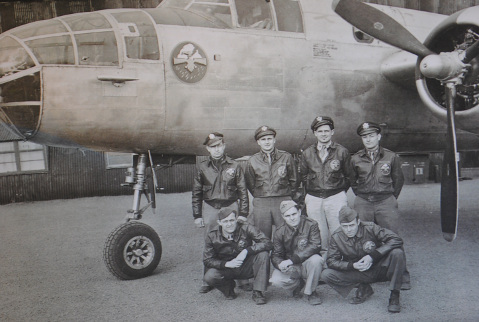 Joe Connell (far right) stands with his aircrew in front of their B-25 on the Azores island of Terceira. General Dwight D. Eisenhower, supreme commander of the Allied Expeditionary Force, and his staff wrestled with many vital decisions in planning the June 6, 1944, invasion of Nazi-occupied Western Europe. Not the least of these was timing the landing of 156,000 American, British, and Canadian forces along a 50-mile stretch of Normandy, France. The success of Operation Overlord, as the assault was called, pivoted on one uncontrollable element: the weather. High winds and cloud cover, which frequently accompany a full moon, would disrupt the Allies’ cross-channel offensive from England. Wind-driven waves could swamp landing craft ferrying troops to the beaches and interfere with paratrooper drops and safe glider landings. A high tide would obscure the mines, tank traps, and other obstacles between the invaders and their landing sites. However, a full moon and a low tide would aid bombardiers, troop-filled gliders, and landing-craft skippers in hitting their targets and avoiding enemy traps. The Germans knew this, too, and were watching weather patterns for signs of the expected attack on Fortress Europe. When stormy weather roiled the English Channel in the first days of June, military planners in Berlin expected the pattern to continue, making landings impossible. In fact, Eisenhower moved the original Operation Overlord D-Day from June 5 to the following day due to the turbulence. A temporary window of calmer weather forecast by allied meteorologists, led by Royal Air Force Captain James Stagg, triggered the change, according to military historians. Bolstering that prediction and other crucial forecasts during World War II was a small army of data-gatherers on the land, sea, and in the air. The <em>Tondelayo</em> B-25 visited Santa Barbara airport during the Wings of Freedom Tour in May. Among them was weather officer Joe Connell, then around 20, of the U.S. Army Air Corps. He was part of a seven-man crew that checked the moods of the Atlantic Ocean from B-25 Mitchell twin-engine bombers based in the Azores archipelago. “I was the guy who took the temperature readings” from a special thermometer mounted along the plane’s nose, he recalled recently, as we talked on the tree-shaded patio of the house he and former Goleta mayor Margaret Connell have lived in for more than 50 years. Four American B-25 weather planes were based on Terceira Island, 900 miles west of Lisbon, Portugal. Two of them flew out 600 miles each day to measure wind speed and direction, gather temperatures, note cloud formations, and collect other meteorological information. “We wanted to get (advance information on) the weather fronts coming into the British Isles and mainland Europe. To do that you needed (current) observations over the Atlantic,” said Connell. Data collected was transmitted to Air Force analysts for processing. The airmen were not informed how it was used. While the Allies had weather ships in some areas, German submarines were active off the Azores, so flying at heights of 1,500 feet avoided that problem, he explained. “No one ever shot at us,” he said, adding that the B-25’s bomb racks were replaced by extra fuel tanks for their patrols. Connell recalls no combat action during his three-plus years of active duty. Today Connell is an esteemed ecologist, educator, author of seminal research on tropical rain forests and coral reefs, and retired UC Santa Barbara professor of biological sciences. Meteorology, it turned out, was not his true cup of tea. However, he remembers his flying days fondly. 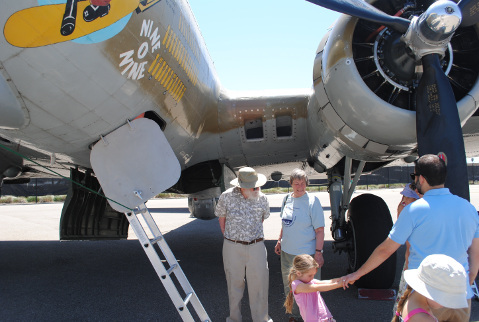 Joe and Margaret Connell were among the visitors to the B-17 <em>Nine-O-Nine</em> at Wings of Freedom. 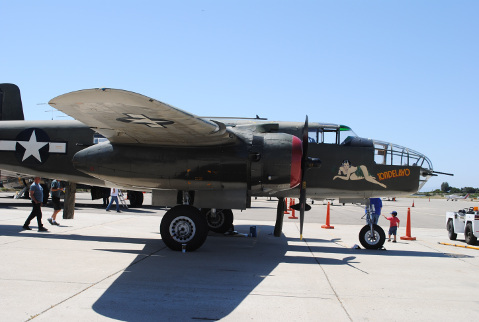 Those memories ran a reality check last month when the Collings Foundation of Massachusetts brought four restored WWII warbirds, including a B-25 named Tondelayo, to the Santa Barbara Airport for public display. Due to his background Connell was invited to check inside the Tondelayo. His reaction as he climbed a ladder and looked into the nose cone’s small, sunlit space where he had sat a lifetime ago? “I enjoyed seeing it up close again, but I thought it was too damn hot,” he said with a smile. Any other memories he kept to himself.